Dante Musica Viva, now over ten years old, has been extremely busy during May and has a number of engagements for the rest of the year. Its second CD – Nostalgia d’Italia 2 – was launched early in the month. It’s available for purchase ($15) from the office. On 2 May it travelled to Griffith in the Riverina to give a two-hour concert focussing mainly on folk and popular Italian/regional songs. The local Italian community supported us wholeheartedly. Some 200 people attended the concert and were so delighted that they asked us to return as soon as possible. 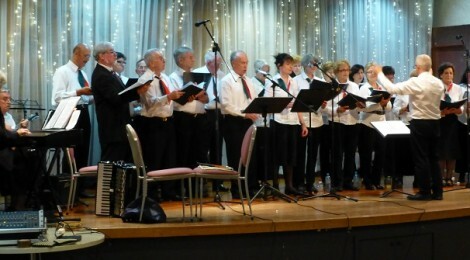 On 24 May it held its third annual concert at the Italo-Australian Club. The repertoire for this audience extended beyond folk/popular Italian/regional pieces – four well-known opera arias were included to the delight of the audience. The most popular pieces (judging by the applause) continue to be Libiam and O’sole mio. The third major performance of the months was on 31 May at the Italian Cultural Centre on the occasion of the community celebrations of Italy’s national day. It performed a variety of popular and lyric pieces. For the rest of the year, it plans to sing in June at the Uniting Church arts and crafts fund-raising concert in Yarralumla; in September at a special concert at the Llewellyn Hall to raise funds for Canberra Hospital’s Neo-natal Intensive Care Foundation; on 3 October at the Italian ambassador’s residence during a dinner to celebrate Dante’s 750th anniversary; in November at the first Festa Italiana in the Embassy Gardens (8 Nov), at the Italian Community Festival (15 Nov in Queanbeyan) and the end-of-year function of the Dante Society (26 Nov). I urge all of you to support our dedicated choir that does such a great job of promoting Italian language and culture through music!